Square Enix has announced the release dates of Final Fantasy X/X-2 HD Remaster for PS4 on both their European blog and twitter feed. 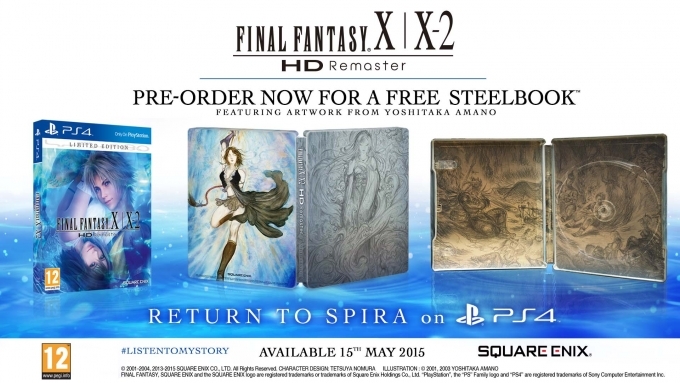 Pre-orders of Final Fantasy X/X-2 HD Remaster for Europe will net you a steelbook cover, featuring Yoshitaka Amano’s art of Yuna on it. Those in North America who pre-order the PS4 version will receive a free desktop calendar with their purchase. If you already own the PlayStation 3 or PS Vita versions of the game, you will be able to transfer your save to the new PS4 version via cross save functionality and continue your adventure from where you left off. A new feature exclusive to the PS4 version will be the ability to select between the original and arranged soundtrack, so you can pick and choose between whichever track style you like. Final Fantasy X/X-2 HD Remaster will release on May 12th in North America, May 14th in Australia and May 15th in Europe.